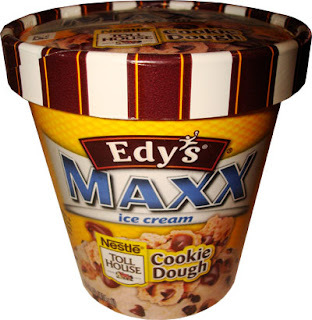 [By Nick, discontinued after 2013] Hey look, another Edy’s Maxx review but this time I didn’t pick this faux-pint up at a gas station! I was wandering through Rite Aid waiting to get my prescription filled (I hate getting sick) and noticed they had a freezer section. Obviously I had to check out the situation and saw this container staring back at me. Since I’ve yet to find this flavor elsewhere I decided to pick it up along with my prescription. Ice cream is medicine as well right? Removing the inner plastic seal, my initial complaints go right out the window. The top layer is studded with chocolate chips and there are a few pieces of cookie dough sticking out. Visually, this one is off to a good start. Trying to get a spoonful of the base alone is difficult but I tried my best. It is just your ordinary vanilla with nothing too special about it. The plainness of the base helps to let the mix-ins shine through though. 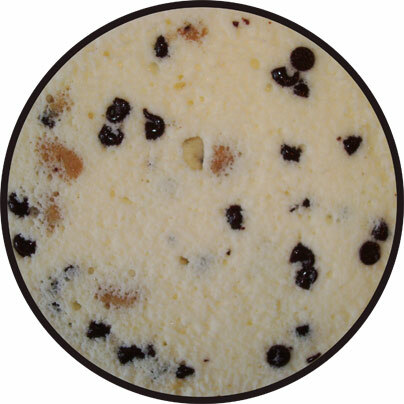 The chocolate chips are more than abundant being mixed into the ice cream as well as the cookie dough pieces. They’re your standard milk chocolate chip, once again nothing special, but in a world filled with “chocolatey” chips, I do appreciate that they’re actually using real chocolate in the ice cream. 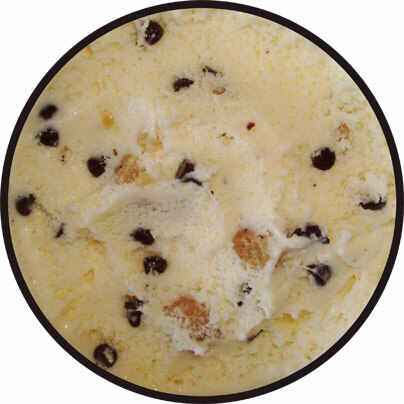 Now let’s move onto the best part of this ice cream, the cookie dough pieces. These pieces range from slightly bigger than the chocolate chips to the size of marbles. Just like every other component of this ice cream, they aren’t that extraordinary, but to me though, they spark a bit of nostalgia. They taste exactly like the dough of the Nestle Toll House break and bake cookies my mom would make when I was younger. They’re buttery with a nice backing flavor of brown sugar. They’re soft but retain some firmness and have a bit of grit to them. The grittiness meshes nicely with the grit that these Maxx ice creams seem to always have. These cookie dough pieces don’t put this one over average in my book but the bit of nostalgia made eating this ice cream more enjoyable. Verdict? Average (at best) cookie dough ice cream. Buy Again? Not likely but possible just for the nostalgia factor. I feel 100% the same way when I had this a couple of years ago. It's just average and nothing special. I've never had Ben and Jerry's Cookie Dough but it's boring ice cream flavors such as these that prevent me from trying B&J's Cookie Dough. Stride, Ben & jerry's cookie dough is leaps and bounds better than this. My favorite cookie dough is still Blue Bunny's but I haven't had the chance to try 2nd Street's version which seeing as they're both owned by the same company might be better. 2nd Street's version is much better but a notch below Ben and Jerry's.